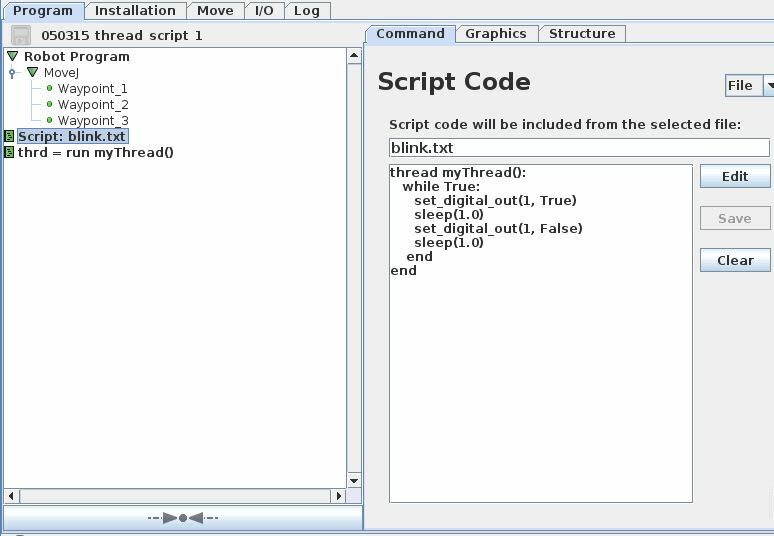 This example shows how to make a Thread in a script file. This thread will turn digital output 1 on and off in 1 second interval. The file is saved with the name “blink.txt” in the same directory as were the GUI program where the script file is to be used. Make a program in GUI. Insert (import) the script file at top level. Use the “File” function for importing the script file into GUI. Use the “Line” function for writing a single line script command. Thanks in advance for the work here as I have already found lots of helpful information. I am currently working on a Visual Studio C# program which needs to be able to send “movel” script commands to a UR5e robot via Socket Ethernet connection. 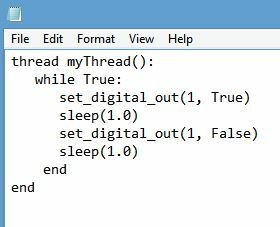 So when I send these commands to the UR5e robot I need to execute a “Thread.Sleep(3000)” C# command after each movel command I have sent to the robot. This works just fine, however, I would prefer to execute the sleep/wait command after each movel command on the robot too. But sending a string which contains the script sleep command does not work for me. Is It possible to send sleep/wait commands to the UR5e robot so that it is actually executed over there? Is it possible to generate strings that include multiple lines each including a command in script syntax (for example here in a C# code environment), then create a file (.script or .txt) and send it to the robot where it is automatically executed? Instead a wait has to be on the robot receiver program – for example like this example. No not to my knowledge – The sleep either has to be on the sender side – or the sleep has to be part of a receiver program as mention above. Thanks for your informative and fast reply! Can you tell me further, if it is possible to send a command from my remote pc to the robot which is able to change the coordinatesystem (like position or/and angles) the manipulator relates to? In my example it is needed, after having reached a certain position, to move along the z-axis of the manipulator (90° angle of the area it spans) just like when a driller has reached a certain position with angles and coordinates, it needs to go down the z-axis while starting the drill process. Currently i am using the unchanged default coordinate system and calculate each point by using the Sin and Cos mathematics. However, if it was possible to change the coordinate system from a remote pc and then just adjust one coordinate here, it would be much more smooth. Is there any specific WINDOWS software dedicated for that? I am not aware of any program for syntax verification of UR script on a PC. But on the UR support page a simulator can be downloaded. Is it possible to send a .script file directly from the PC with python over Socket connection? Maybe if you program a FTP transfer in Python, but I have not seen such function. I try to create a thread, with which i can save analog_in values (from a sensor) every 0.5 seconds. The analog_in values shall all be saved in a vector or something similar. Do you know how to solve this Problem, or create a vector/table … something else for saving all the values? It is possible to make a list. At this link there is an example of variables as lists. (In this example the list contains poses – so the “p” might not be neccesary if the list is not made of poses). My programm is working now. To my knowledge this is not possible on the robot. Maybe it can be considered to do that on an external device and then send the sum string back to the robot. Is it still possible to have top level scripts in the latest version of Polyscope (3.3)? It is possible to insert a Script file with functions in the BeforeStart sequence – and then call these functions from various places in the program – which also can be used to initialize settings and variables. Below is three functions that are made in a “.txt” file on a PC. In this example the script file is named “top_level_script_1.txt” and stored on a USB drive. Then on the robot in Polyscope program the above script file is imported (as a file) in the BeforeStart sequence by using the “Script Code” (File) from the Advanced menu under the structure tab. In this example the “init” function from the Script file is called in the BeforeStart sceuence in order to initialize some settings and a variable. The payload setting can be observed and verified from the “initialize” menu – and the tool voltage can be observed and verified from the I/O tab. 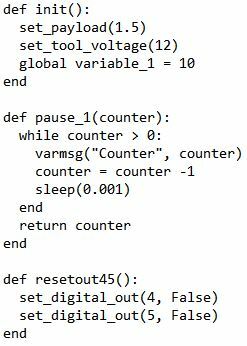 In the main part of the Polyscope program the function “pause_1″ from the Script file is used as an adjustable delay for toggling the output 2 by calling the function with a parameter. The main program also sets output 4 and 5 to a high state – but every 5 second the Thread is resetting the output 4 and 5 back to low state. The change in “variable_1″ can be observed and verified from the “Variables” tab. At the start of the program the variable_1 is set to 10 because the “init” function is called – and later in the main program the variable_1 is set to 1 and will remain at 1. I have some problem to read data from UR10 on port 30002. I first receiv the right data comparing to robot data. But the following packet from robots seems to be wrong. Do you have any ideas why. Can you show some example of the correct and wrong data and why you think they are wrong ? Hello! I was wondering if there is a way to create a variable and change it through script code and then use it in another script code and if there is a way how can you do it? Thanks in advance and keep up the good job, your other tutorials have helped me a lot! Depending on whether you use script programming from a remote host (PC) or you use script programming locally on the robot – you might consider to use the MODBUS server at port 502. The MODBUS has general purpose registers at address 128 to 255 and they can be reached on port 502 where data variables can be stored and fetched. Hello I want to know if it possible to plug a joystick on the UR10 and which interface can we use to write a script. I have not seen any solution where the joystick is plugged directly into the UR. This solution is using a PC where the joystick is connected – and the PC sends commands to the robot. Thanks for your answer if I write a program on c++ or java, the UR10 will be able to read it? As long it is the UR script code the UR recognize that is send to the UR you can use many different programming methods. Where can I find Package URx for java? I have seen these package for python. Does it exist for Java? I have not seen the package you mention, but maybe other on the forum have. When you wrote the code for joystick did you need to write a specific code to the side of robot? I try to use thread to move specified joints of the robot so I can perform a complicated motion. The message that I get when I try to run the program is that “An other program is controlling the robot”. How can I over come this problem? How can I do parallel programing on the robot? A thread is parallel programming – however not for moves because it is a robot – and the robot can only be at one locations at a time – so if one thread say the robot should be at one location and another thread or main program say the robot should be at another location – then there is a conflict and therefore thread is not for moves. Instead you can control variables and monitor inputs and set outputs in threads in parallel with the main program. 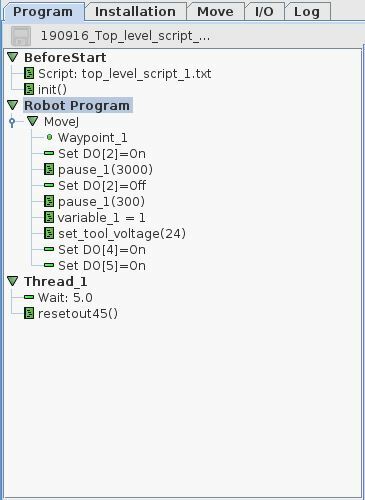 Maybe you can consider to control variables in threads and then use the values of these variables to decide where the robot should move in the main program.